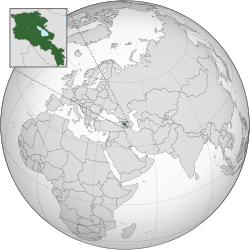 ↑ "The World Fact Book – Armenia". Central Intelligence Agency. Archived from the original on 19 ᱡᱩᱞᱟᱭ 2010. Retrieved 17 ᱡᱩᱞᱟᱭ 2010. ↑ "Statistical Service of Armenia" (PDF). Armstat. Retrieved 20 ᱯᱷᱮᱵᱽᱨᱩᱣᱟᱨᱤ 2014. ↑ ᱑᱐.᱐ ᱑᱐.᱑ ᱑᱐.᱒ ᱑᱐.᱓ "Report for Selected Countries and Subjects". World Economic Outlook Database, April 2018. Washington, D.C.: International Monetary Fund. 4 ᱚᱠᱴᱚᱵᱚᱨ 2017. Retrieved 17 ᱡᱟᱱᱩᱣᱟᱨᱤ 2018.